Working as a UN Volunteer in an organization like MINUSTAH is a life changing experience. I am motivated by the progress made on the environmental performance of the UN as the result of our highly motivated and creative team who works hard to reduce the UN’s environmental impact. From environmental management systems to campaigns on waste, our role in “greening the blue” is vital. 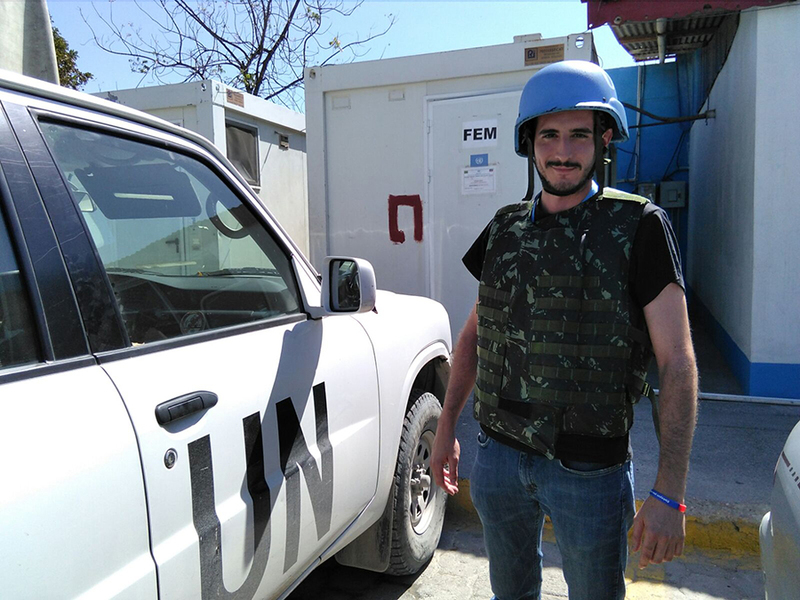 As a UN Volunteer Environmental Engineer Assistant with the Environmental Compliance Unit (ECU) at the United Nations Stabilization Mission in Haiti (MINUSTAH), I work with the Civil, Military and Police components of the mission. The MINUSTAH mandate is to support the Government of Haiti in the stabilization of the country and, to achieve this objective, the Mission is committed to conducting its activities in an environmentally friendly manner. We make sure that the highest environmental standards are kept within our premises. I conduct environmental briefings to all newcomers so that they are aware of their environmental responsibilities and can collaborate to keep the environmental impact to a minimum. I also travel the country carrying out Environmental Inspections, and I make recommendations to help contingents and MINUSTAH improve their environmental performance. I also help organize campaigns that raise important environmental issues such as recycling or saving water. I provide support to ECU on waste management, wastewater management, pollution control, Greenhouse Gas emissions, and compliance with environmental laws and regulations, mainly through environmental inspections of the Mission sites, technical assistance on Standard Operating Procedures and environmental briefings. I work closely with the different units of the Mission Support Division, which is inspiring and rewarding because you develop a useful collaboration with various stakeholders, each with a specific focus on their area of intervention. This is especially rewarding when the environmental inputs are successfully mainstreamed into the Mission activities. To me, one of the greatest challenges working in environmental management is to convey the understanding of the crosscutting aspects of environmental work to partners, while taking into considerations their priorities, and to contribute therefore to the improvement of practices towards environmental protection. Bio: Pablo Sánchez Ortega (Spain) was always interested in volunteering. He volunteered with ONGAWA, a Spanish Engineering NGO, for eight years, where he participated in campaigns to make citizens aware of environmental problems, with a focus on developing countries. He also had the chance to volunteer with this NGO in a project related to Energy Access in Tanzania. After that, he worked at the Spanish Agency for International Development Cooperation (AECID) on environmental issues. When he later had the opportunity to become a UN Volunteer in an environmental position, it was something he could not miss, since it combines both his vision and his objectives - volunteering and the environment.